This story is purely based on my own experience using ProtonVPN service. I am starting with their 7-days free trial, which gave me the trial for their Plus plan ($8/mo). In short, I am really satisfied with their 7-days trials but will give a try their free tier plan first once my trial period ends. It's still two days before my trial ends, so I'll tell the story I've gone through during this trial. Yes, I said I am really satisfied with their 7-days Plus trial, but I don't mean it was a smooth sailing. After discussing with my own self about if I really need a VPN, I decide to look some recommended VPN providers on internet. ExpressVPN with $99.95 every 12 months, with 30-days money back guarantee. Private Internet Access with $39.95 per year. ProtonVPN with $48 per year. Not a cheapest one, I know. Why I choose ProtonVPN in the first place? Simple. It's offering a Free plan, which I confirmed with their that I can upgrade if I needed higher plan. At this point, I still have no idea if they will give me the 7-days Plus trial after I've signed up. For the first two days, everything works smoothly. But not for the next days, when the problems are starting to show up. On the third day, I always run a problem that it's getting very slow near midnight. The same problem occurred around the same hours on the fourth and fifth day of the trial. But this problem will go away as soon as I restarted their app ( I am using latest MacOS Mojave ). 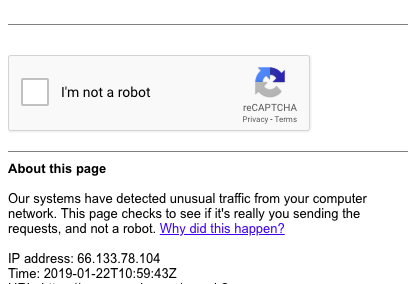 Another problem I have is when accessing Google.com, sometimes Google is asking for human verification like the screenshots on the right. It's a bit inconvenient, but since I hardly used Google when I am connected to their VPN server, it does not bother me too much. In fact, it's not always happening when I switched to another VPN server. I am not a paying customer, so I just try to contact their support through their Twitter. I am not a paying customer. I am not sure if the problem is on their side because I don't see others sending the complains to their Twitter account. But I still give it a try and sending a tweet to them, which ends up to be a little conversation. However, their response is beyond my expectation. They reply within 1 hour, in fact, it's probably only 10-15 minutes after I send my tweet about the problem. Here's my conversation between me and their support on Twitter. Giving the fact that I am not even a paying customer, and still not decide to go for their paid plan, I can say their support is top-notch. They reply me quickly, pointing out the possibilities of the problem, and pointed me to some of their articles to help me. Though in the end, they said that the problem may be with my ISP provider since they did not see others sending the complain like me. Since I realize that I am not a paying customer, I decide to test my ISP -- of course I am not giving them a phone call and asking if they're blocking my connection to VPN sever. The last day when the problem happened, I don't restart the app as I've done it on previous days. Instead, I disconnect my Mac from my home wi-fi and connect it to my phone's wifi. My phone is using another ISP which serving 4G networks only. The result is my connection which goes through ProtonVPN service is restored. Honestly, I am still not convince that it's that my home ISP who's trying to tamper my connection to ProtonVPN server (as they said on their replies on Twitter). Because if my home ISP had been trying to tamper or block my connection to ProtonVPN server, I won't be able to connect to ProtonVPN servers anymore, right? is the proof that my ISP did not block or tamper with that. So, ProtonVPN is just blaming my ISP for their own problem? No. Because if they did this, I will see many other folks flooding their Twitter with bunch of complains. Then, what's the problem? I am not sure but I suspect that my ISP may have a glitch to connect to ProtonVPN server. Again, this is just my hypothesis for the thing that most-likely caused my connection problem with ProtonVPN. Offered free plan. Though I am still not sure about this plan's performance. Will update on this once my trial period ends on the next two days. Offered 7-days-trial for their Plus plan. It's said to be built by the CERN scientist. For me only, and for those whose ISP had a problem to connect to their VPN server. Explained above. Google is asking human verification when I connect to one or two of their US VPN servers. This often happened to me when I am connected to their US-WA servers. Not the cheapest one compared to their competitor. Will I sign up for their paid plan? Most likely yes, but I want to give a try their free tier plan first. If their free tier plan is enough for me, I'll still consider to sign up for their paid plan because I just want to support them to provide those "free tier" plans for others.